Google Street View can help us navigate from place to place, learn about different parts of the world and discover unusual, humorous moments recorded completely by chance. Now, it’s being leveraged as an art platform. 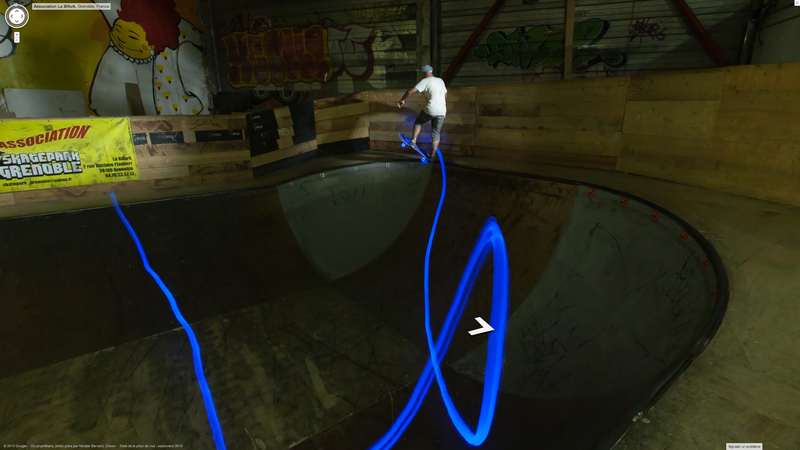 Guilhem Nicolas, known as the ‘painting with light’ photographer Jadikan-LP, teamed up with fellow snappers Damien Leleux and Nicolas Bernard of The Odoxo Agency to create a unique virtual tour of La Bifurk, a skatepark and concert venue in Grenoble, France. The technique, which requires a long shutter speed and the movement of a light source throughout the frame, creates trails of light across the park. It’s spectacular to look at: one rider appears to have purple smoke rising from the ground, while another grinds around a bowl with a Tron-style trail of blue light streaming behind him. A word of warning though: The skate park is the interesting part, but you’ll start off in the concert venue – keep moving to get to the good stuff.